Patrick Kelly has donated a copy of this book as a free prize to give thanks to those who support myArmoury.com. Over the last decade, the study of European swordsmanship has become increasingly popular, with schools opening in Great Britain, the United States, Canada,Poland, France, Australia, Italy, Germany and Finland. 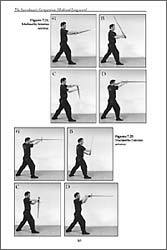 Drawn from a host of historical treatises, modern instructors are reconstructing the lost arts of swordsmanship, creating new methodologies based on the original texts. Although there are now many fine translations and interpretations of individual medieval masters, there has been no work aimed at the beginner. 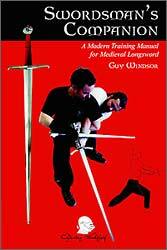 With the Swordsman’s Companion, Guy Windsor has broken new ground, presenting for the first time a modern system based on historical techniques.Combining (as they did) fighting with the sword with wrestling and efficient footwork, Mr. Windsor’s book will prove intersting to any reenactor, martial artist, or student of medieval or renaissance military culture. 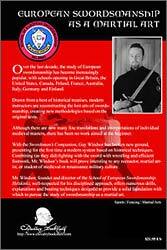 Mr. Windsor, founder and director of the School of European Swordsmanship, Helskinki, well-respected for his disciplined approach, offers numerous drills, explanations and bouting techniques designed to provide a solid foundation with which to pursue the study of swordsmanship as a martial art. This contest is only available to those members who have contributed to myArmoury.com by purchasing an Enhanced Membership (upgraded or premier), donated money to our site, or who have subscribed to the Exclusive Offers and Promotions usergroup. You must be joined prior to Monday, September 6th, 2004. All participants will be entered into a drawing and the winning name will be randomly selected later that same Monday. Because this contest automatically enters all members of the Exclusive Offers and Promotions, Premier Members, Upgraded Members, and Donating Members groups, I'll contact the winner to make certain he wants the prize. If not, another winner will be selected. This is an excellent book, folks. It focuses specifically on those who don't have a group to train with or an instructor, but has some excellent advice about swordsmanship in general for even a seasoned practitioner. I particularly enjoyed Guy's philosophy and approach to historical swordsmanship in general, especially applied to bouting. 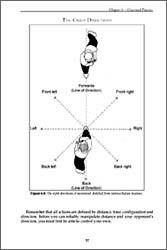 It's specifically about the Italian system of longsword, but even for you German longsword guys (raising hand myself) you'll learn a lot from it. Thanks to Patrick for donating the book and to Nathan & myArmoury crew for another great prize/contest. This is something I could really use, since I'm out here on the other side of BFE, with not real instructors close by. Not to take this OT, but to take it OT for a moment. Tobler has a new one out that I recently purchased. Similar general idea, German school. thus far a good read and a helpful tool to the beginner, in this case me. Can't wait on Lady Luck (if it is indeed a lady), I'm ordering both Windsor's and Tobler's books! But great contest nonetheless. Keep it up! Click here to see who the lucky winner is!